This modification should be attempted only by people with experience working with delicate electronic circuits. It is quite possible to damage your calculator during this modification. Observe static precautions and beware of heat damage. If you find any errors, please contact the curator. 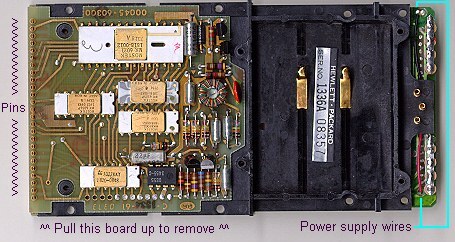 The HP-45 had an undocumented timer feature which was relatively inaccurate due to the lack of a crystal. This modification adds a 784 kHz crystal (and possibly a resistor) to improve accuracy. With the back removed, remove the eight screws that hold the backbone to the front case. Carefully remove the backbone and circuit boards while holding the calculator face down to prevent the keys from falling out. The power switch may stay with the front case or stick to the circuit board. Remove the CPU circuit board from the keypad/display board by gently pulling it up off the pins and set it aside. 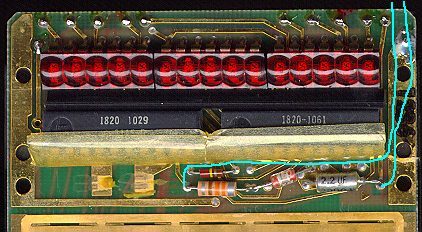 Once this circuit is removed, the only things holding the backbone to the keypad/display board are the power supply wires. You can either leave them attached and rotate the backbone out of the way or desolder them. The light blue lines represent wires you will add. You may also wish to glue a small piece of plastic to the back of the ENTER key such that ENTER presses both key contacts when depressed. With this modification you can press RCL and then ENTER instead of RCL and then CHS-7-8 (at the same time) to enter timer mode. This bit of plastic is shown in blue on the back of the ENTER key below. Try resistors in the range of 1K-100K ohms until you get reliable operation.